Many gamers will have heard that for a while Microsoft has been aiming to replace their currency for Xbox Live and Games for Windows Live from Microsoft Points to real local currency. Ie. Dollars, Euros and Pounds Sterling, or what ever your local currency is. In doing this the Xbox Live and Games for Windows Live services will need to make the switch over. This is scheduled to be be kicking off on August 22nd. However, the bad news is that Games for Windows Live will not be making the transition to local currency and as such, Microsoft is infact closing the GFWL service all together. Infact as of just August 22nd the Games for Windows Live Store will be closed to new purchases of any kind. This means that no additional copies of Age of Empires Online or any DLC will be available via this store from August 22nd. 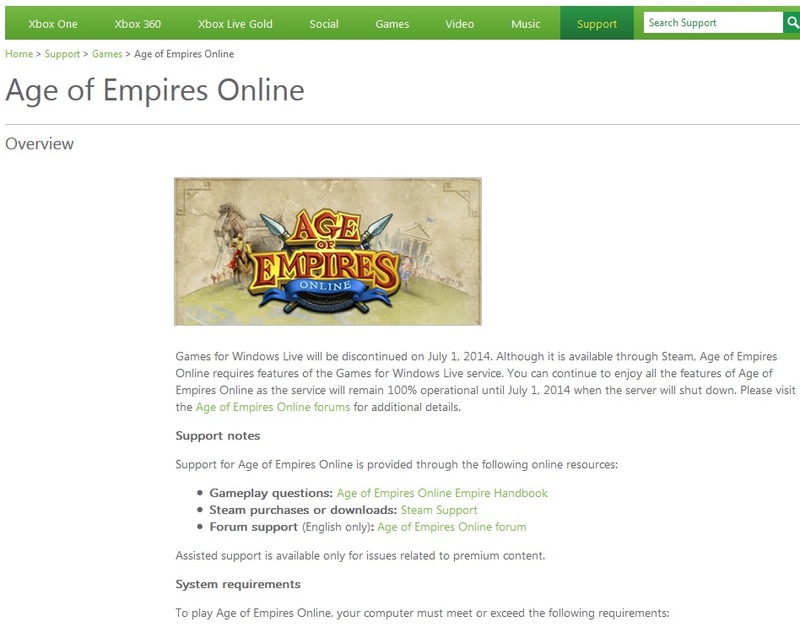 It would seem that any DLC purchased through Steam would also not be available based on a now removed article on the AOE-O support website as reported by Age of Empires Online Heaven. Although the Steam issue is still awaiting official confirmation. The bad news continues I’m afraid. While existing players will be able to continue to play Age of Empires Online beyond the August 22nd cut of date, the game will be shuttered completely on July 1st 2014 when the entire GFWL system will be taken offline. This is of course very sad news for the co-developed Robot Entertainment and Gas Powered Games title. Many AOE-O fans are incredibly disappointed by the closure news and discussions are aplenty on the official forums. According to a recent article on Gamasutra there was another “post-mortem” conducted on Age of Empires Online by its Executive Producer, Kevin Perry at GDC 2013 just recently. The presentation was titled “F2P the wrong way” indicated that there was not enough content at launch, and by the time they were rolling out new content the efforts unfortunately did not result in bigger enough population boosts. As a result development was halted in January earlier this year. I would say that now would be the time to spend any Microsoft Points you were thinking of spending on AOE-O before August 22nd. However, as it seems the game will be closing entirely in July 2014 this will no doubt be a quandary for many players. Stay tuned for REF for further updates on this sad situation. Age of Empires Online launching August 16th!